Immerse yourself in an eldritch nightmare that’s as challenging as it is innovative with Darkest Dungeon’s dismal and hopeless world. If you’re looking for an indie game that’s held in higher esteem by the PC gaming community than the average AAA title, then Darkest Dungeon might just be an excellent place to start – if you’re into gory horror, eldritch designs and punishingly hard RNG-based gameplay, doubly so. The premise of Darkest Dungeon takes a classic RPG formula of turn-based combat and flips it on its head with an initially complex-looking system; where you’re flung into battles with next to no help, at the mercy of the horrific creatures you’re encountering. Sounds appealing, right? Unlike many of the light and bright indie titles that claim to be child-friendly and fun to pick up and play, Darkest Dungeon is anything but; instead focusing on a dystopian nightmare environment with a heavy focus on despair and horror through a very Lovecraftian lens that fans of the darker side of things will love. In fact, the abstract horror of your hapless characters are even integrated within the gameplay itself; with the ‘stress’ of your unfortunate players building over time, and either sending them slowly mad, resulting in the further stress of their accompanying party, or (much less often) revealing unique heroic traits. 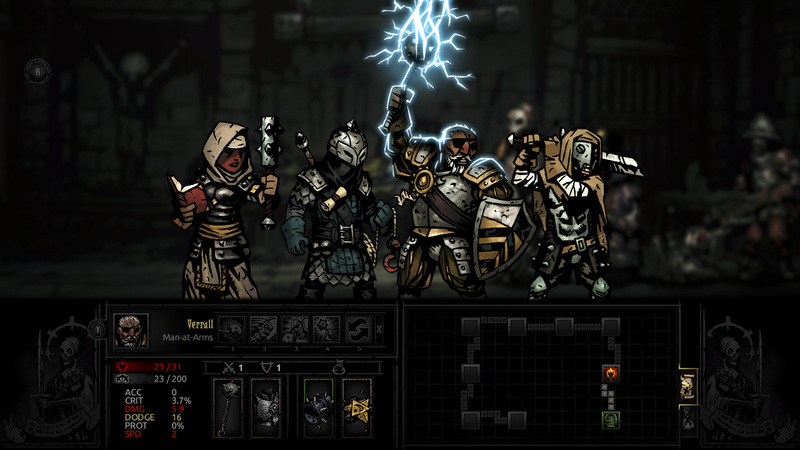 The basis of Darkest Dungeon’s gameplay is a balance between keeping your party of four alive, creating the best team combination to succeed in your next excursion and managing the overall stress level of your party. Either you’ll return from each mission with anything from treasure to unique character items that can be used to boost the skills of your chosen team, or leave in disgrace with half your crew left behind to perish. One of the things that make Darkest Dungeon so different from similar games on the market is the fact that at times, it feels like the game wants to you fail; it’s entirely possible for an inexperienced player to have every single one of their characters die in one mission, for example. But oddly enough, this intense difficulty curve can make the game more enjoyable to play rather than one you’ll want to miss; because there’s nothing more satisfying than beating those odds and returning to base with just a Rabies disease rather than leaving half your team to rot in that dungeon or forest. 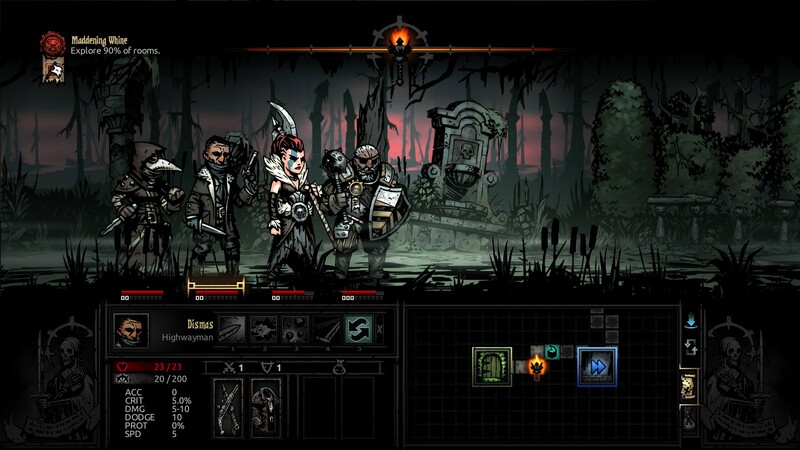 Multiple DLC expansions, available at excellent prices, have also further extended the longevity of the game and added other gameplay features such as additional quests, more elements to manage and even an endless mode; all of which remain completely on-theme with Darkest Dungeon’s overall atmosphere, pulling heavily from Lovecraftian styling and horror. But, excellent gameplay aside, one thing that Darkest Dungeon does the best out of any genre of game is the atmosphere they produce with their world; from the tumbledown, miserable state of the village you find yourself in, to the terrifying and often unappealing environments that your party of four must fight through to take on multiple bosses. The dulcet tones of Wayne June, the narrator for the Darkest Dungeon game and DLC, offers even further immersion into the world with his musings and warnings that steal the show throughout gameplay. And in some excellent community outreach, his voice has even been lent to some of the most popular Darkest Dungeon steamers out there to lend some of that atmosphere to their playthroughs of the game. If you’re considering introducing a new game to your play schedule, Darkest Dungeon isn’t a choice to be taken lightly; a half-hour play session can easily turn into a full day, or alternatively, end after a single run after a particularly frustrating bout of gameplay. Either way, if you’re looking for a unique, challenging game to enjoy, it might be worth picking Red Hook’s eldritch creation.